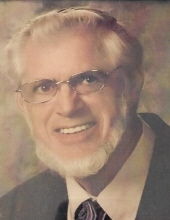 JAMES HAROLD MEYERS, 77, a 40-year resident of Lapeer, passed away Sunday, January 27, 2019. James was born March 13, 1941, in Pontiac to Harold T. and Charlotte (Taylor) Meyers. He attended Lapeer High School. James married Nancy Elaine Shelly in Fowlerville. James worked as a mechanic for McDonald Dairy in Flint for 30 years, retiring in 2001. He was a big part of the bus ministry at First Baptist Church in Lapeer for 13 years. James was an active member of the Hadley Community Church for over 20 years including his service as a deacon. James was a loving husband, father, grandfather and brother. James is survived by his wife, Nancy Meyers; children: Rodney (Amy) Meyers of Houston, TX, Laura (nee, Meyers) Marshall of Lapeer and Scot (Ruth) Meyers of Richmond, KY; ten grandchildren; sisters, Norma (Mel) Ferrett and Annette Brace. He was preceded in death by his parents, Harold and Charlotte Meyers. Memorial contributions may be made to the Hadley Community Church Children’s Ministry, PO Box 26, Hadley, MI 48440. A memorial service will be held at 11 a.m. Saturday, February 2, 2019 at Hadley Community Church in Hadley. James’ family will receive friends from 10-11AM the morning of the service. Pastor Bruce Craner will officiate. Cremation services have been entrusted to Muir Brothers Funeral Home, Lapeer and burial will be at Sanford Cemetery, Cohacta, MI. "Email Address" would like to share the life celebration of James Harold Meyers. Click on the "link" to go to share a favorite memory or leave a condolence message for the family.